Made with 100% natural ingredients, so it’s safe for you and your pet. –　Pure natural ingredients work up into a rich lather. Compare the texture of your pet’s coat after you’ve thoroughly cleansed and dried ? we guarantee you’ll see the difference. –　After repeated use, fur becomes noticeably suppler. –　The twin products are a No. 1 repeat seller at many of our retailers. –　Contains zero chemical surfactants, antioxidants, preservatives, or artificial colorings that are known to cause atopic dermatitis and rashes in dogs and cats. –　The shampoo kind to your pet’s skin and fur contains natural vitamin E, and herb extracts that fight off fleas and ticks. –　All-natural ingredients are kind to the skin and fur. –　100% natural means it’s safe to use for pet owners with sensitive skin. 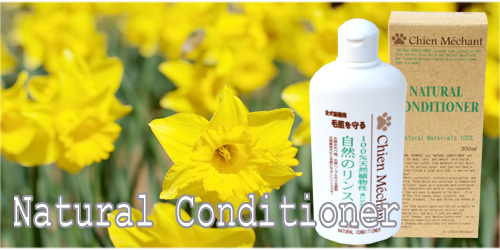 –　Purely natural shampoo & conditioner are biodegradable, so they’re ideal for outdoor use. –　Contains sunflower oil as the main ingredient, and a blend of natural vitamin E and other natural ingredients. –　Can be diluted with 4-14 parts water prior to use. –　Works best with Chien Mechant Natural Conditioner. –　To protect the environment, Kitagawa Co., Ltd. donates a part of the sales of this product to the Association of National Trusts in Japan. 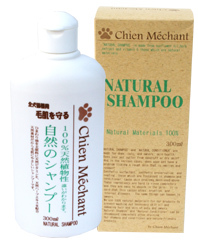 Chien Mechant Natural Shampoo & Conditioner were developed with a focus on healthy skin – both for dogs and cats and for the people who care for them. Does your pet have fleas, a dull, dry coat, or worse, red irritated skin, which it incessantly licks? One factor that is known to cause these symptoms is the chemical compounds such as surfactants, additives, and coating substances contained in shampoos and conditioner. Your pet’s skin and fur are burdened with these additives no matter how well you conditioner off the product. Soft parts of the skin can absorb the chemicals and cause atopic dermatitis, rashes, skin diseases whose origins cannot be traced, and even internal disorders. This is not limited to pets either – it can be said of humans as well. And this is why we focus on 100% natural ingredients, so the products don’t strip your skin of necessary oils, and so they’re kind to your pet’s skin and fur. 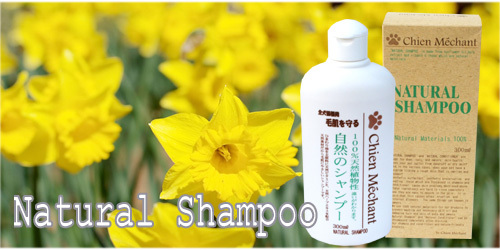 Chien Mechant Natural Shampoo & Conditioner are biodegradable, so they’re also kind to the environment. Skin and fur protectant Natural Shampoo for all dog and cat breeds Natural Shampoo is purely ingredients, with sunflower oil as its main ingredient. Wash with running water if the product comes in contact with the eye. White dandruff-like substances may appear at the onset of product use, but this is the exfoliation of old skin layers burdened by the use of chemical shampoos. Do not worry, as the symptoms will disappear after 2-3 uses. –　The weak acid conditioner moistens fur for a lasting shine. –　Natural herb extracts fights off fleas and ticks. –　Contains jojoba oil and a blend of rosemary, lavender, eucalyptus, sage, chamomile, thyme, etc. –　Works best with Chien Mechant Natural Shampoo. 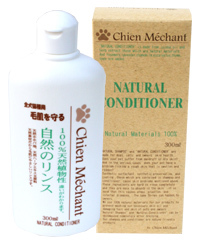 Skin and fur protectant Natural Conditioner for all dog and cat breeds Natural Conditioner is purely ingredients, with jojoba oil as its main ingredient. The product will not cause eye damage, however, if conditioner enters the eye, flush with running water. Either dilute the product with warm water or dispense the concentrate into your palm, then apply to fur, massage, and rinse lightly with clear, warm water.